Huma Abedin gave false statements to FBI agents in 2016 AND 2017, YET SHE NEVER WAS CHARGED! The FBI previously declassified Huma’s 302 summary from her 2016 interview with Peter Strzok and David Laufman. Hillary’s ride-or-die aides, Huma Abedin and Cheryl Mills both lied to Strzok and Laufman. Abedin lied to Strzok in her 2016 interview when said she had no knowledge of Hillary Clinton’s private server until after leaving the State Department in early 2013. Abedin did not know that Clinton had a private server until about a year and a half ago when it became public knowledge,” according to Strzok’s 302 summary interview with Huma. Email exchanges between Huma Abedin and other Clinton aides in 2010 and 2011, however, reveal she was fully aware of Hillary’s private server before it became public knowledge. Huma Abedin reportedly also lied to investigators in her late 2017 interview and a declassification of her 2017 302’s would make that clear, says investigative reporter, Paul Sperry. According to the Washington Post, the FBI interviewed Huma Abedin in the winter of 2017 after they closed the Hillary email case for the second time. The FBI interviewed Abedin a month and a half after they closed the Clinton email case. FBI agents wanted to know how and why Hillary Clinton’s classified emails ended up on her pervert husband Anthony Weiner’s laptop. 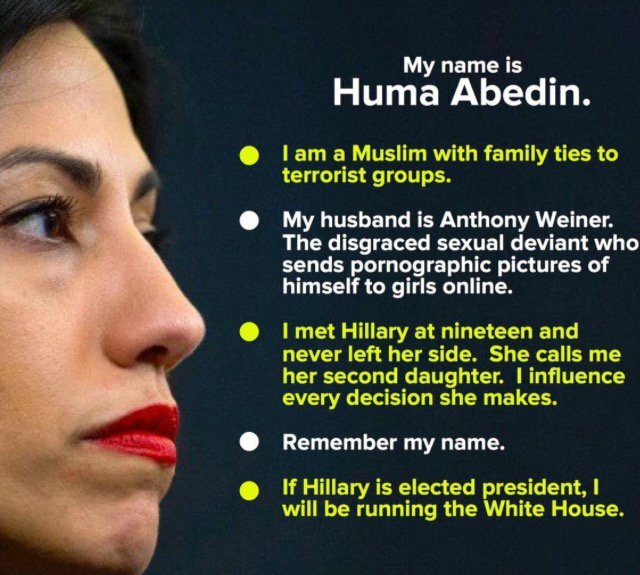 Huma Abedin previously insisted to FBI agents she didn’t know how Hillary’s emails ended up on her husband’s laptop. Some emails were forwarded to Weiner and others were saved on his laptop because of an automated backup process. Trump’s former National Security Advisor Mike Flynn was charged, and is awaiting sentencing after making a false statement (supposedly) to the FBI, yet Huma Abedin roams free. In fact, Senate investigators now believe Andrew McCabe altered Flynn’s 302’s after Strzok’s ambush-style interview. Next Next post: “BEST” Movie Line EVER! !